This post was provided by InnerDrive, a mental skills training company. Nobel Peace Prize Winner Al Gore once remarked “that if you want to go fast, go alone. If you want to go far, go together”. So what are the benefits of building a good team of people around you? Why is teamwork important? How exactly does it help? Author Jim Rohn suggests that you are the average of the 5 people you spend the most time with. If you look at any successful person, in every walk of life, they often have a team around them. One classic example of this is the team at Microsoft. Most people associate Microsoft with just Bill Gates. But as he has said many times, he couldn’t have created it all by himself. Legendary American football coach Vince Lombardionce commented that “confidence is contagious”. It turns out, the same is true for effort. That was the finding of a recent journal which found that if the person next to you is working hard then it increases your work ethic. Interestingly, this impact was found to be consistent regardless of whether they were doing an easier or more difficult task then you, or whether the task is similar or unrelated to yours. As well as improving work ethic, another studyfound that teenagers who had to perform a problem solving task together “engaged in more exploratory behaviour” and “learnt faster from positive and negative feedback” than compared to when on their own. 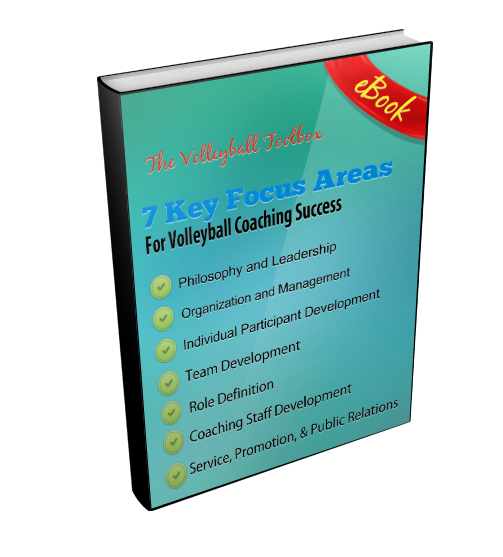 One of the greatest basketball coaches of all time, Phil Jackson once said that ‘the strength of the team is the individual. The strength of the individual is the team’. We think this is definitely true. A team is comprised of individuals. If we help each individual maximise their talents, then the team gets stronger. However, it is the support, advice and guidance of the team that can help the individuals develop their skills. Having access to a supportive network of individuals who can offer you social support has been found to act as a stress buffer and improve coping. It has also been found to have a positive impact on your mood and well-being. Social support comes in many forms; it can be someone giving you advice, some making you feel better about the situation or simply listening to you vent. All three are important. Finding people who can help you satisfy each of those needs is key to building a good team around you. Having people around you and asking them for support and advice has been found to be a key way that Olympic champions develop their resilience. A problem shared really is a problem halved. 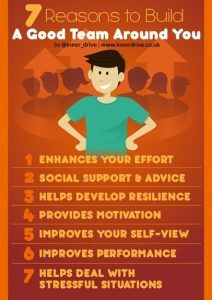 It is not just Olympic gold-medallists who get this advantage, a growing body of research suggests that social support can be a powerful predictor of resilience to stress for everyone. Social support plays a key role in helping students develop their resilience, and self-esteem. All too often, and especially in teenagers, people think that asking for help is a sign of weaknesses. In fact, the opposite is true. Asking for, and actually using, feedback is the hallmark of a mature learner. Motivation is known to be enhanced by a variety of different things. These include a sense of purpose, choice, mastery and personal belonging or relatedness to a group. For university students in a randomised control trail test, being part of a peer-network helped increase participation in physical activity. These peer networks were more successful than promotional messages in motivating students to participate. In elite sport, rugby player Jonny Wilkinson talks in his autobiography about the realisation that if he gave himself to the team, then he would get that support back 15 times more, as each player would support him. This realisation helped propel him to international stardom and ultimately winning the World Cup in 2003. How other people talk to us has an impact on us, even at a very young age. Researchers have found that the type of praise that we are given age 1-3 years old, can predict our mindset up to 5 years later. We talk more about the importance of praise and the different types here. Having a trusted network of individuals who you can turn to can be an extremely helpful coping mechanism for dealing with life stresses. This is why the NHS urge people to connect with others in order to improve their well-being. Other techniques to improve wellbeing include being open to learning, being physically active and giving to others (all of which can be done with other people). This is something we have written about in more detail here. In arguably the first ever study in sport psychology, researchers found that simply having to perform a task in front of other people made people work harder. Fast forward a hundred years and we see the same benefit in the work-place. In a study of over 300 people, researchers found that having a deep and meaningful relationships with the people you work with can improve your performance. They found that colleagues who had good personal relationships had more trust, support and pride in their work. That is not to say there are no potential drawbacks, the authors note that it can be draining having to offer social support to others whilst also doing your work, but on the whole, the benefits to work performance outweighed the costs.